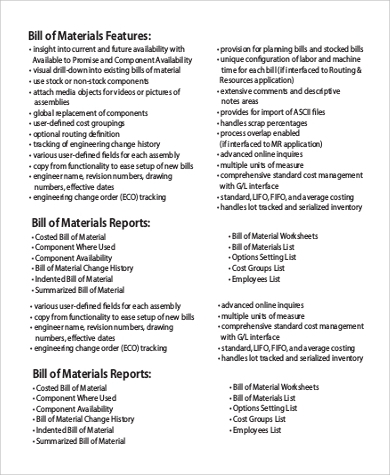 A bill of material is a list of raw materials, parts, components, and the quantity needed to finish a product. 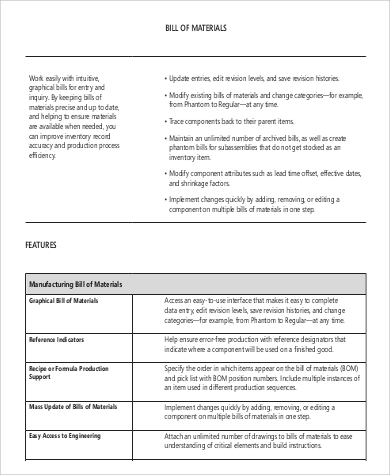 This document can be used to communicate to clients and are usually used for production orders. They describe the product and the materials needed when they are designed, ordered, or built. If you ever need one, you can definitely make use of the bill of Material List Samples that we have in this article. There are nine templates that you can choose from. Each of these templates will serve as a great guideline for whenever you will be needing one. Just browse through all of our samples below. quantity needed per part to make the finished product. 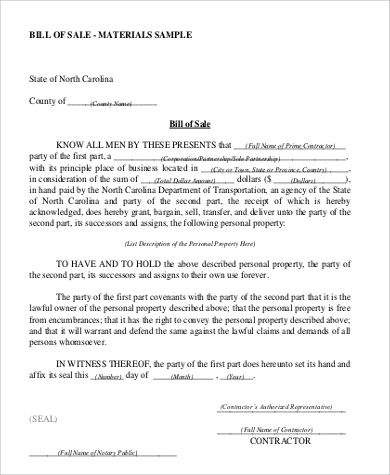 A bill of material will vary depending on the preference of the supplier or client. 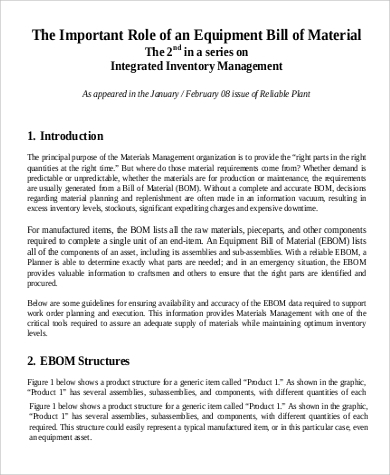 Some bill of materials will include other descriptive information like the unit measure of each part and how to acquire the part needed for the production of the product. 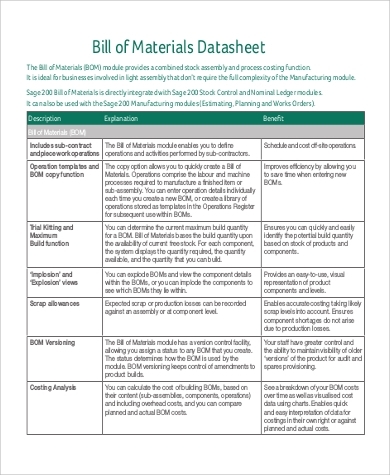 A bill of material can be used as a tool to keep an accurate and centralized record of the parts that is needed for producing and manufacturing of products. 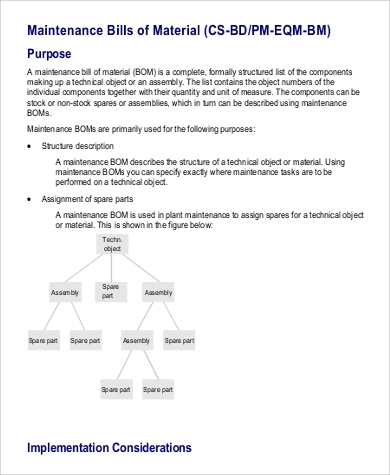 A bill of material can help improve the management of materials. 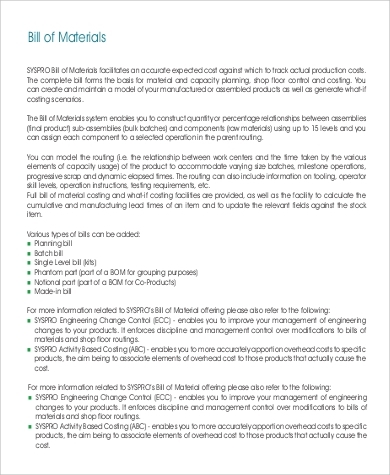 It can help you respond accordingly to any changes that might be needed during production. A bill of material can help reduce any part that may be deemed as obsolete, which can in turn help control the inventory level of each part. The estimates and quotes provided in a bill of material can help lower the manufacturing cost of the production. You might also want to check out Bill of Sale Samples. 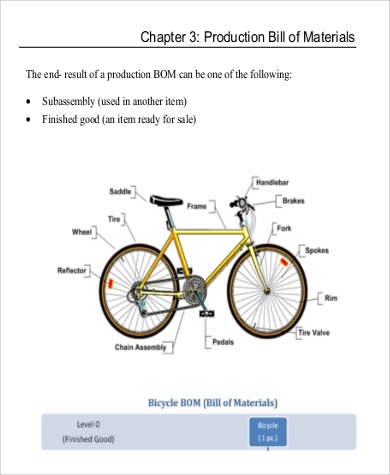 In order to properly document all the parts that are needed to make an end product, a bill of material is a great tool to use. 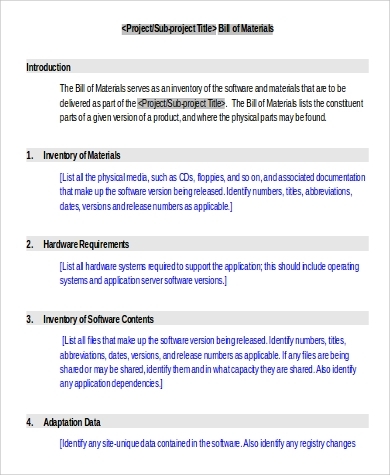 The bill of material samples in this article can help you out with doing just that. It is an essential business document that production industries can make use of. Here are a few reasons why using the templates for a bill of material can prove to be beneficial. There are nine unique samples that you can choose from. Each has varying designs and layouts. These sample templates are easy to download directly from this article. You will not be redirected to another website once you click on the DOWNLOAD button. 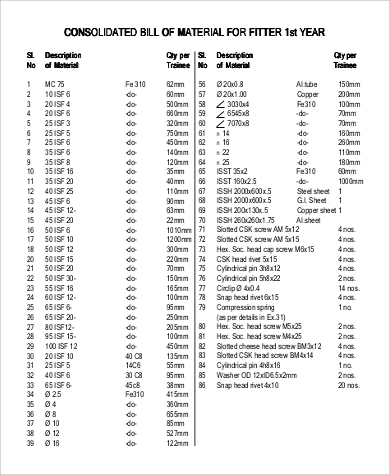 The templates are available in both PDF (.pdf) and Word Document (.docx) file formats. Such file formats are very easy to edit and store in your gadget and storage device. You can download all of these templates for free. These sample templates are designed to have fields that are ready to list down all of the needed materials you will need for producing a product. When you use a bill of material, there will be a need for you to place an order. Having a sales order form can be handy. You may see Sales Order Samples.